Credit:: C.L. Sonnichsen Special Collections, University of Texas at El Paso Library. Collection Name: MS160 Hoppock Collection. Photo ID: MS160-4-3-037. The image shows a family visiting the Al G. Kelly & Miller Bros. Circus, in March 1960. It was a popular circus, showing wild animals like lions, elephants and zebras. The circus was started in 1938 by Obert Miller and his sons, Kelly and Dory; today it is simply known as Kelly Miller Circus. It began as a small dog and pony show with the Miller family performing most of the acts. Due to the creative talents and showmanship of Obert and his sons, the small circus was very successful in it's first years. The Miller family carried a large menagerie; in the 1940s they bought their first elephant, a giraffe, polar bears, a black rhino and a hippopotamus. 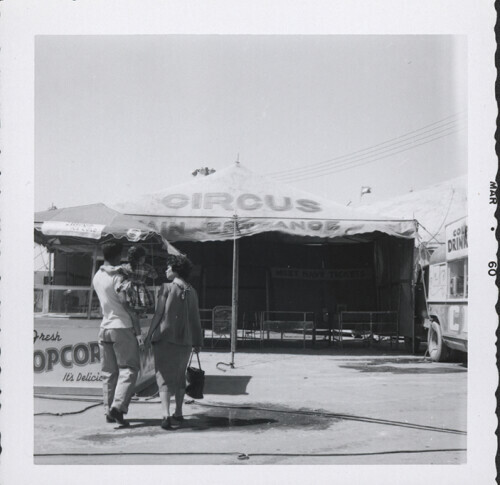 The Miller Family devoted their lives to their circus and managed to built it into America’s 2nd largest big top show. 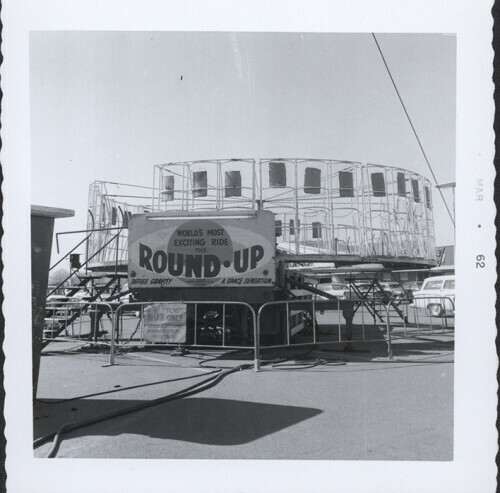 They introduced hundreds of new circus artists to the American public and countless innovations in circus operation. From 1984 through 2006, David Rawls, third generation circus manger directed Kelly-Miller Circus, and in 2007, John Ringling North II took over. His great uncles were the famous Ringling Brothers. Credit:: C.L. Sonnichsen Special Collections, University of Texas at El Paso Library. Collection Name: MS160 Hoppock Collection. Photo ID: MS160-4-4-033. 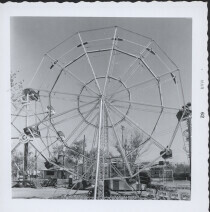 The image shows the ferris wheel of the Paul A. Miller Big Top Wild Animal Circus. 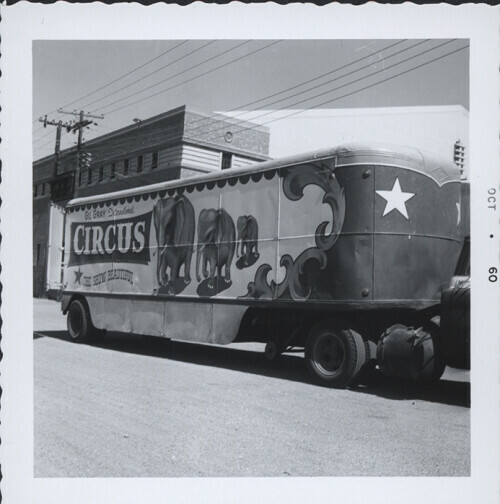 It was a small circus which promoted shopping centers. 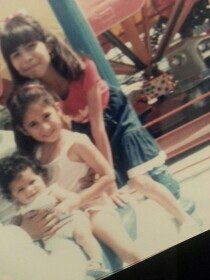 It came to the Lakeside area in El Paso in March 1962. The circus carried flying acts, cats acts, sway pole, elephants, music and clowns. Many members of the Miller family were involved. Credit:: C.L. Sonnichsen Special Collections, University of Texas at El Paso Library. Collection Name: MS160 Hoppock Collection. Photo ID: MS160-4-4-043. 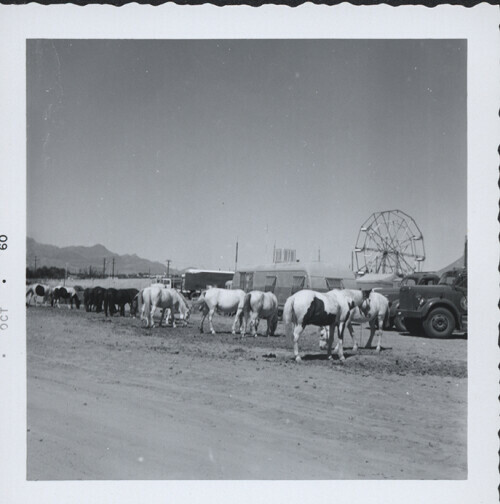 The horses belonged to a circus which visited El Paso in October 1960. Which circus in unclear. 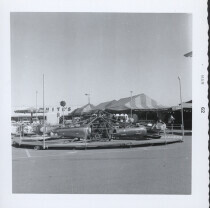 In the background, a ferris wheel can be seen. The location of the circus was probably next to the Coliseum. The Franklin Mountains are in the back. Credit:: C.L. Sonnichsen Special Collections, University of Texas at El Paso Library. Collection Name: MS160 Hoppock Collection. Photo ID: MS160-4-4-004. 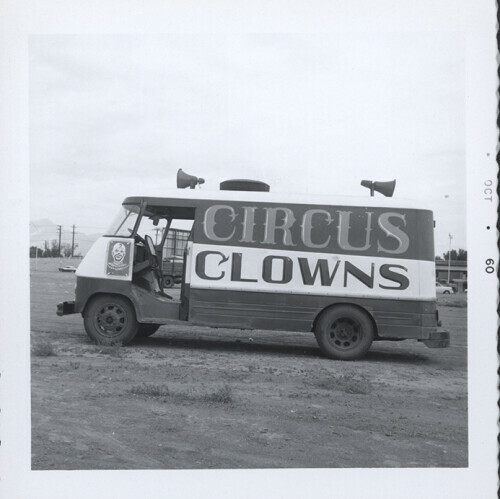 The image shows one vehicle of the Gil Gray International Circus. 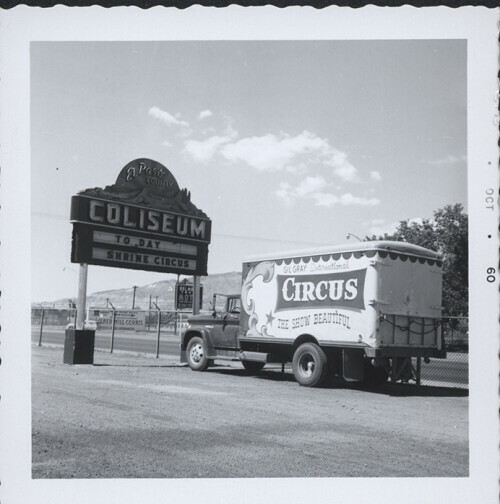 The circus was in El Paso in October 1960, and set up next to the Coliseum. Credit:: C.L. Sonnichsen Special Collections, University of Texas at El Paso Library. Collection Name: MS160 Hoppock Collection. Photo ID: MS160-4-4-014. The King Bros. 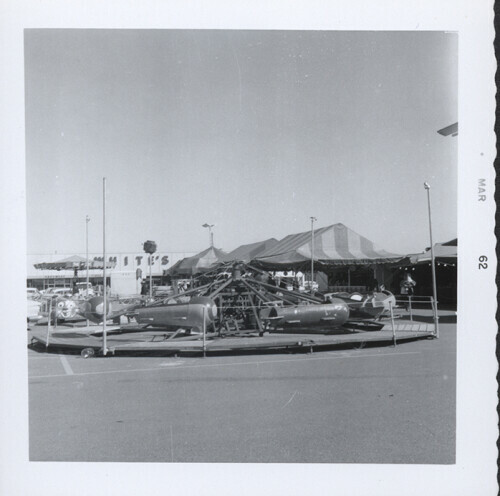 Circus was a popular circus which stopped in El Paso in October 1960. Two of its elephants can be seen in the picture. Credit:: C.L. Sonnichsen Special Collections, University of Texas at El Paso Library. Collection Name: MS160 Hoppock Collection. Photo ID: MS160-4-4-002. Credit:: C.L. Sonnichsen Special Collections, University of Texas at El Paso Library. Collection Name: MS160 Hoppock Collection. Photo ID: MS160-4-4-023. The King Bros. 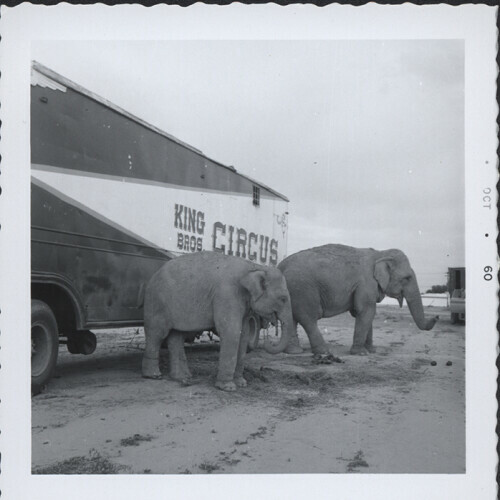 Circus was a popular circus which stopped in El Paso in October 1960. The wagon of the clowns can be seen in the picture. Credit:: C.L. Sonnichsen Special Collections, University of Texas at El Paso Library. Collection Name: MS160 Hoppock Collection. Photo ID: MS160-4-3-045. 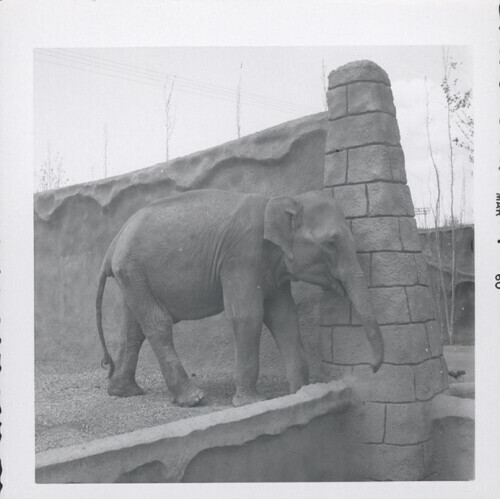 The image shows one elephant at the El Paso Zoo in March 1960.
Credit:: C.L. Sonnichsen Special Collections, University of Texas at El Paso Library. Collection Name: MS160 Hoppock Collection. Photo ID: MS160-4-3-043. 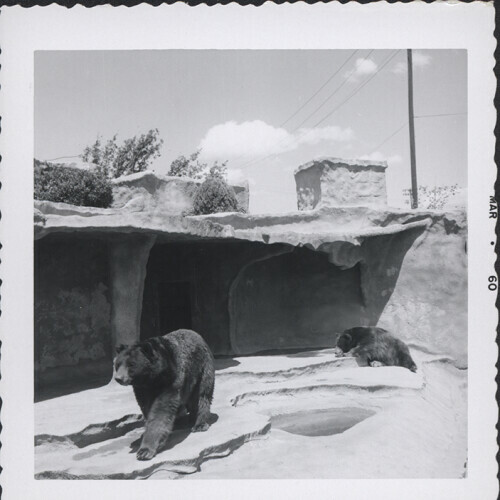 The image shows two bears at the El Paso Zoo in March 1960.
Credit:: C.L. Sonnichsen Special Collections, University of Texas at El Paso Library. Collection Name: MS160 Hoppock Collection. Photo ID: MS160-4-3-035. 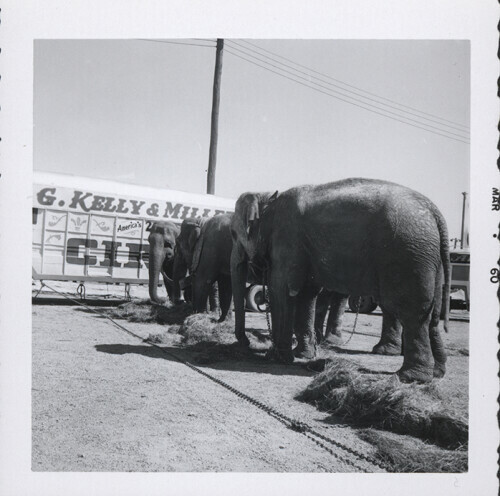 The image shows some of the elephants of the Al G. Kelly & Miller Bros. Circus, in March 1960. It was a popular circus, showing wild animals like lions, elephants and zebras. Credit:: C.L. Sonnichsen Special Collections, University of Texas at El Paso Library. Collection Name: MS160 Hoppock Collection. Photo ID: MS160-4-3-032. The image shows a lion and a Brahma bull of the Al G. Kelly & Miller Bros. Circus, in March 1960. It was a popular circus, showing wild animals like lions, elephants and zebras. Credit:: C.L. Sonnichsen Special Collections, University of Texas at El Paso Library. Collection Name: MS160 Hoppock Collection. Photo ID: MS160-4-3-022. The image shows one wagon of the Al G. Kelly & Miller Bros. 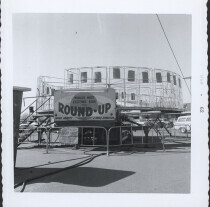 Circus, in March 1960. In it, one can see one of the lions of the circus. 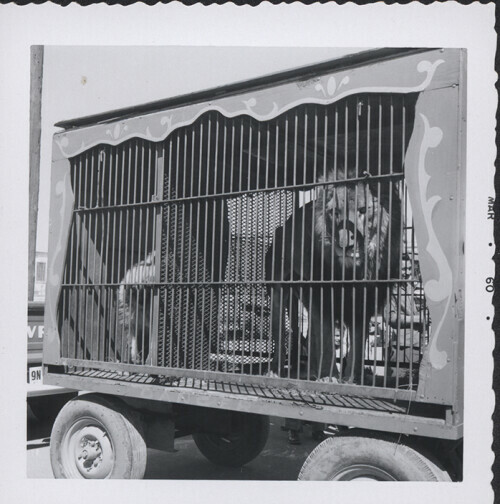 It was a popular circus, showing wild animals like lions, elephants and zebras. Credit:: C.L. Sonnichsen Special Collections, University of Texas at El Paso Library. Collection Name: MS160 Hoppock Collection. Photo ID: MS160-4-3-013. 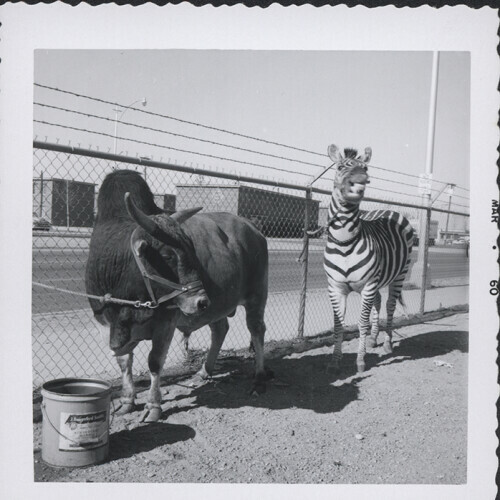 The Paul A. Miller Big Top Wild Animal Circus was a small circus which came to El Paso in March 1962. It promoted shopping centers. It carried flying acts, cats acts, sway pole, elephants, music and clowns. Many members of the Miller family were involved. Credit:: C.L. Sonnichsen Special Collections, University of Texas at El Paso Library. Collection Name: MS160 Hoppock Collection. Photo ID: MS160-4-3-001. 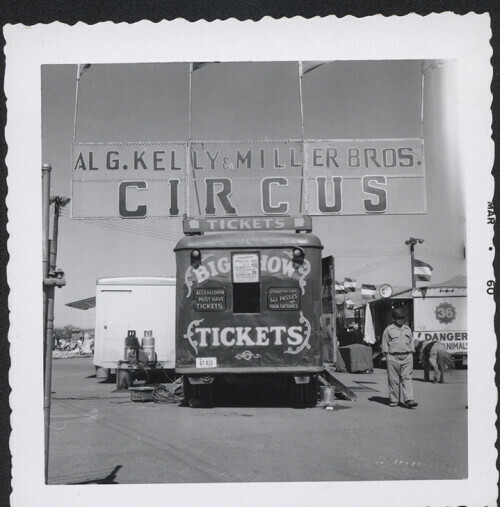 The image shows the entrance and the ticket wagon of the Al G. Kelly & Miller Bros. Circus, in March 1960. It was a popular circus, showing wild animals like lions, elephants and zebras. Credit:: C.L. Sonnichsen Special Collections, University of Texas at El Paso Library. Collection Name: MS160 Hoppock Collection. Photo ID: MS160-4-3-005. 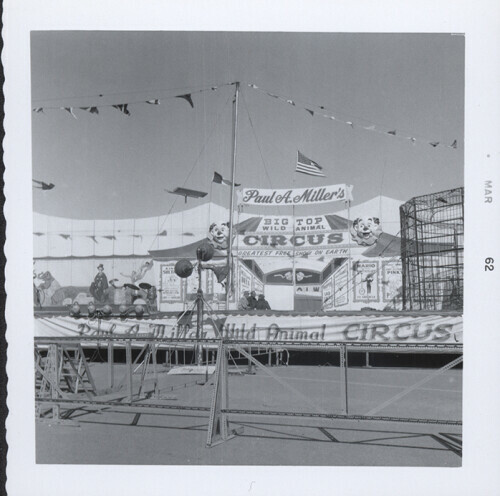 Paul A. Miller Big Top Wild Animal Circus was a small circus which promoted shopping centers. 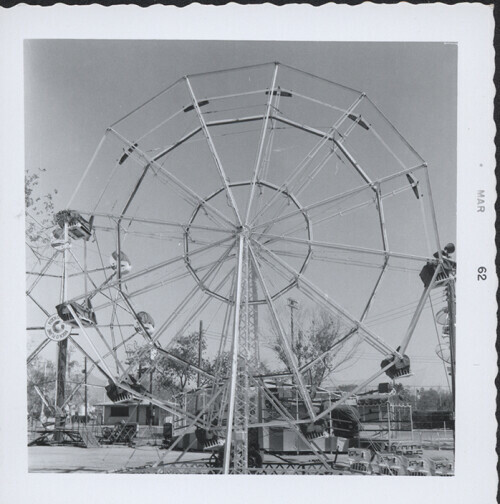 It came to the Lakeside area in El Paso in March 1962. The circus carried flying acts, cats acts, sway pole, elephants, music and clowns. Many members of the Miller family were involved. 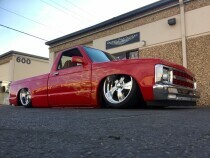 Credit:: C.L. Sonnichsen Special Collections, University of Texas at El Paso Library. Collection Name: MS160 Hoppock Collection. Photo ID: MS160-4-3-007.